The Dipsy Doodle trail is located in the Sunlight Mountain Resort Nordic Area near Glenwood Springs, Colorado. The upper end of Dipsy Doodle begins off of the Babbish Express trail. From there is makes a gradual descent that takes it though peaceful stands of aspens followed by a mixed forest of aspens and conifers. The groomed route that it follows runs all the way down to an intersection of the Little Beaver and Ute Connection trails. 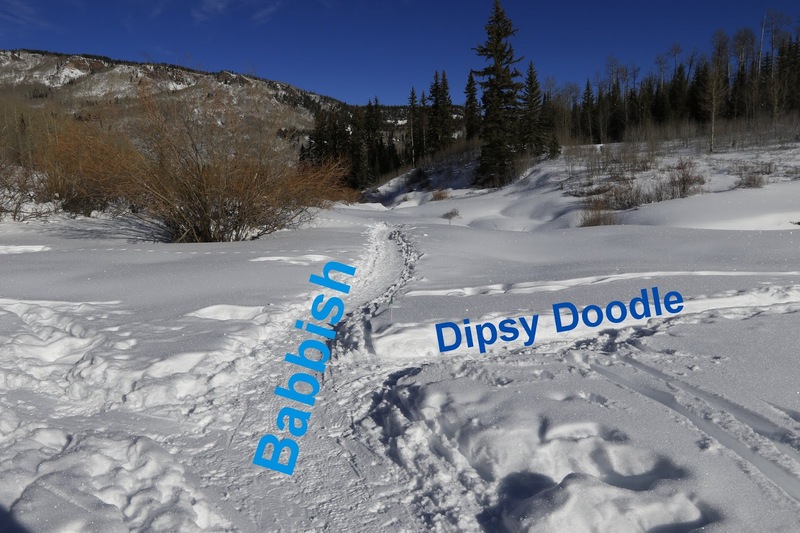 There are also several places where there are short connecting routes between the Dipsy Doodle and Babbish trail. For this post we started out at an unmarked connector on the Babbish trail We were using a copy of the map that they hand out at Guest Services that showed a longer ungroomed section of trail that began near the intersection of the Babbish and Williams trails. Since there weren't any trail signs anywhere for the Dipsy Doodle trail and we couldn't pick the route on the map out of the snow we chose this short connector as the starting point. The well traveled ungroomed connector crosses the stream that runs down Babbish Gulch and climbs the easy hill on the opposite side that leads up to the groomed trail. At the groomed trail you can go to the left to get down to an intersection where the Ute Connection meets up with the Little Beaver trail. Close to that spot is also the upper end of the Glades trail. If you keep going on the Ute Connection it will come out on the Ute downhill ski run. Going to the right on the groomed trail it is only about 100 feet to where the top of the Little Beaver trail begins on the left. Little Beaver starts out as an ungroomed trail for the top half but then transitions onto a groomed route that ends down at a junction with the Old Four Mile trail. Except for a couple of dipsies the Dipsy Doodle trail is all uphill going in this direction. The slope stays easy to moderate though for the most part. 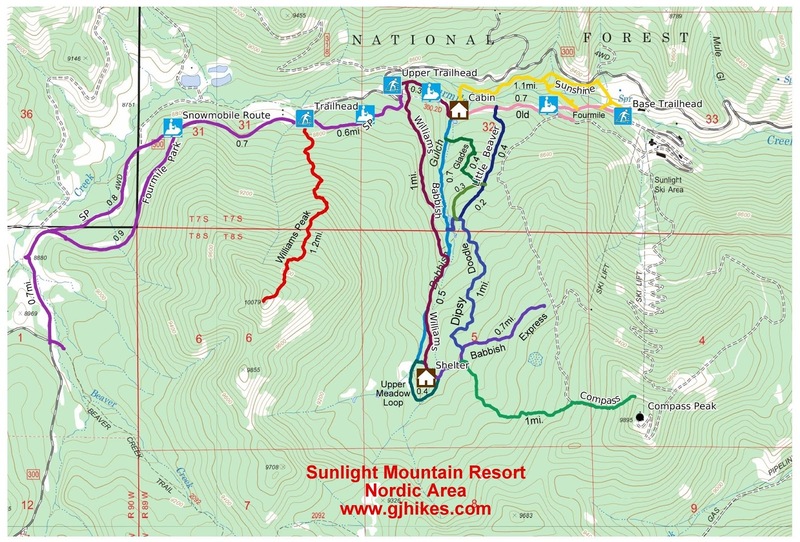 The groomed trail is packed firm enough that fat tire bikes and trail runners can breeze along with little difficulty. Step off the trail on this day though and you'll be buried almost up to your waste in powdery snow. We've never been up here during the summer months but we did notice a picnic table that in this photo is covered with snow on the right side of the trail. In the heart of winter the shadows are long in the forest even at high noon. The upper portion of the trail doodles through widely spaced stands of aspens that allow a little more light in to brighten up the wintery scene. 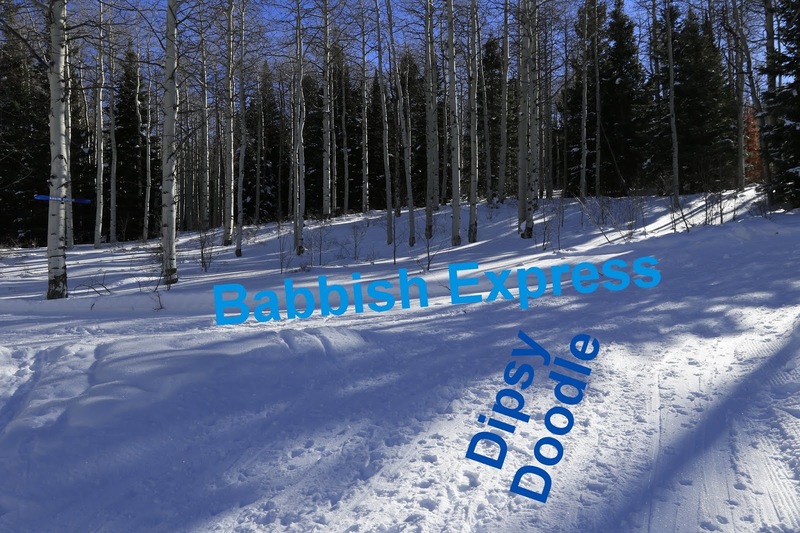 Dipsy Doodle comes to an end when it meets up with the Babbish Express trail. A half mile to the left at this point is the Ute downhill ski run. Going to the right about 500 feet is where the lower end of the Compass trail begins and a quarter mile to the right will get you to the cabin shelter and the upper end of the Williams trail. 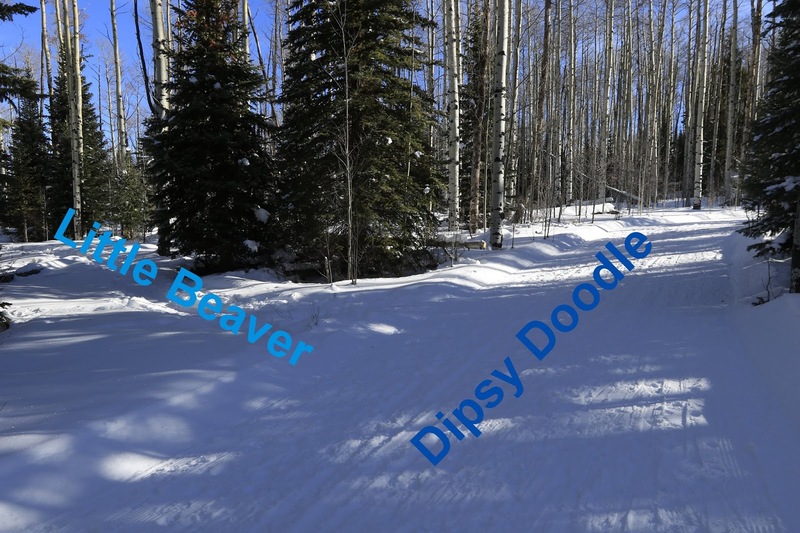 No matter which trailhead you begin at you will have to travel more than a mile of other trails to get to the Dipsy Doodle trail. Once you get there you will find it's a pleasant place to push around in the snow and it will probably be all downhill to get back to where you began. If you would like to see it for yourself then all you have to do is 'Take a hike'.